﻿﻿Guiding Question: How does an author create realistic characters with Mood ... Tone ...Word Choice ... and Characterization? This novel is separated into four "marking periods" that are the grade-marking periods of Melinda, our main character. We will read one marking period a week. Reading is done in class with students responding to their reading as Journal Entries (document below). The Journal Entries are material for our Graded Discussions (documents below). At the end of each marking period, we will have a Graded Discussion with the last two discussions being graded for standards in the grade book. Each week, we will have activities that support the student's exploration of Diction, Tone, Word Choice, and Characterization. The final project is to produce a concept map (graphic organizer) that identifies and explains the development of an aspect of the story over the four marking periods (document will be added when finalized). You can read this novel as a paperback in class, or as a PDF, or an EPUB, or on a Kindle, or Online. These documents have specific activities and purpose. 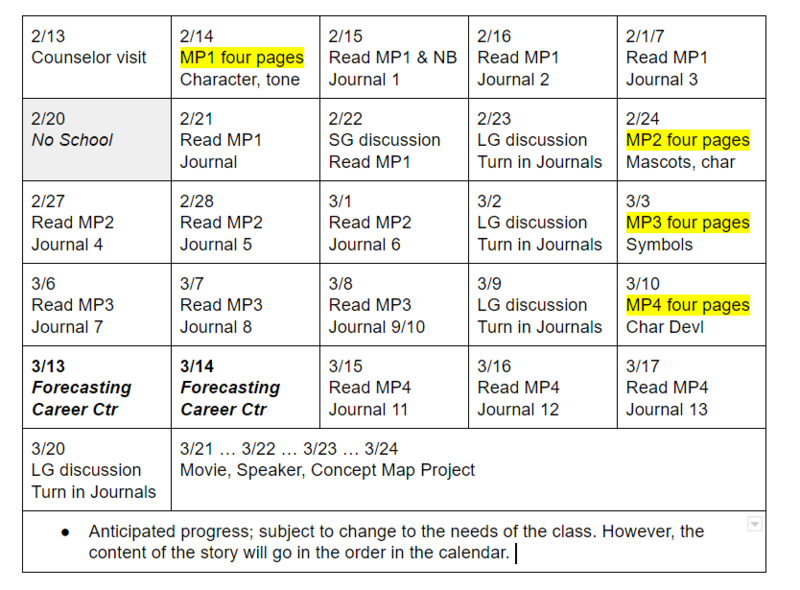 IF YOU ARE ABSENT, YOU CAN EMAIL ME FOR THE DAY'S ENTRY TASK AND MINI-LESSON.